Did you know, that when baking, if a recipe calls for vanilla extract you can substitute it with Bourbon for the same flavour! If you like bourbon, I've got some recipes to share using a bottle of Four Roses single barrel Kentucky straight bourbon whiskey, which was sent to me recently. Four Roses Bourbon are launching their Yellow Label, Single Barrel and Small Batch Bourbons in the UK this summer. It's the only bourbon distillery in the world to combine 5 yeast strains with 2 separate mash bills to produce their 10 distinct bourbon recipes, each with a unique character, spiciness and rich fruit flavour. I was really pleased to try this bourbon, as I like using different alcohols in my cooking, and my husband has a collection of whiskies and cognacs which I'm not allowed to touch! He was obviously very happy for me to be sent the bourbon and said it was probably the best thing I had ever received from blogging, ha!! The amounts make roughly 4 servings, depending on the size of your cake rings, mine were 70mm in diameter. If you don't have cake rings, you can use ramekins or wine glasses. Break up the cake, sprinkle with bourbon and spoon it into the bottom of the ramekins or wine glasses. 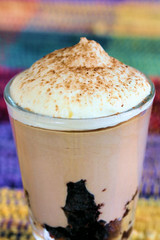 Pour on the bourbon/Mars cream and top with freshly whipped cream, see photo at end of recipe. Push the cake ring into the cake and cut out 4 circles, placing them into the bottom of the rings, which are then placed onto a small baking tray lined with baking parchment. 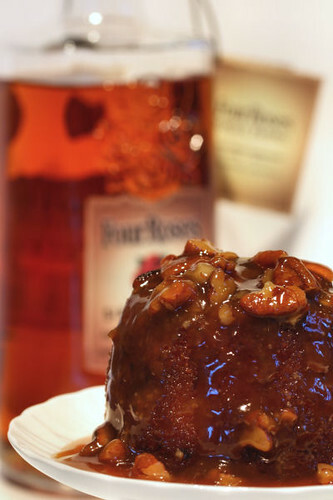 Brush or pour a teaspoon of the Four Roses Bourbon onto each of the cake circles. 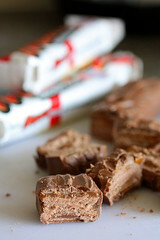 To make the creamy filling, put the cream, chopped Mars bars and butter into a small saucepan and gently heat, stirring until the Mars pieces have melted. Remove from the heat and add the Four Roses Bourbon. Pour into a bowl and allow to cool completely, then using an electric hand whisk, whisk until pale and thickened. Pour this mixture evenly onto the cake bases and put into the fridge overnight. To serve, place the desserts onto serving dishes and gently push them out of the rings, you may need to warm the rings up with your hands or waft very briefly with a cooks blowtorch to get them to come out. 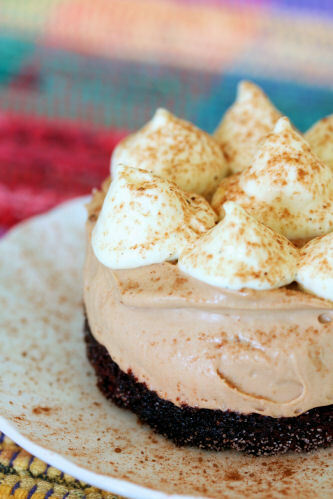 Whisk the whipping cream until firm and pipe or spoon onto the top of the desserts, dust with cocoa powder. You don't need cake rings, just make it in little glasses! Adapted from a Delia Smith recipe, I made half of her original recipe and added a tablespoon of Four Roses Bourbon to the dates, adjusting the amount of boiling water. Start by putting the chopped dates into a small bowl and pour over the boiling water (minus 1 tablespoon). Add the vanilla extract and the bicarbonate of soda and put to one side. In a large mixing bowl, cream the butter and sugar together, using an electric hand whisk, until the mixture is light and fluffy. Beat in the egg, followed by the 1 tablespoon of Four Roses Bourbon. Carefully fold in the flour with a metal spoon, followed by the date mixture - including the liquid. Don't worry if the mixture looks a little runny at this stage. Divide the mixture equally between 3-4 pudding basins or ramekins - the amount will depend on the size of your containers. Place them onto a baking tray and bake in the centre of the oven for about 25-30 minutes. While the puddings are in the oven, make the sauce by combining all the sauce ingredients in a small saucepan and then heat gently until the sugar has melted and dissolved. When the puddings are cooked, remove from the oven and leave to cool for 5 minutes. Using a cloth to protect your hands from burning, slide a small knife around each pudding and turn it out. If they have risen a little too much, you can slice a little off the tops of the pudding so they sit evenly on the serving plates. When you are ready to serve the puddings, pre-heat the grill and pour the sauce evenly over the puddings, pushing any large nuts off the top to prevent them from burning. Let the puddings heat through for about 8 minutes, the tops will become brown and lightly crunchy an the sauce will be hot and bubbling. Serve with fresh pouring cream or a scoop of vanilla ice cream if wanted. Delicious, but very strong, so please drink responsibly! Put all the ingredients into a blender and whizz until well mixed. 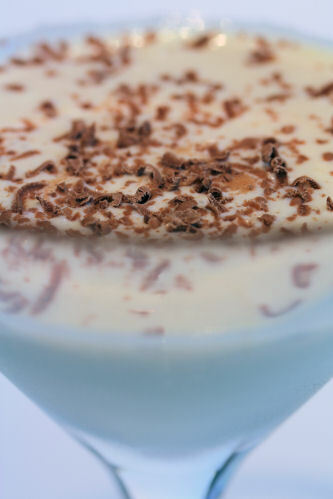 Pour into a glass and garnish with grated chocolate. 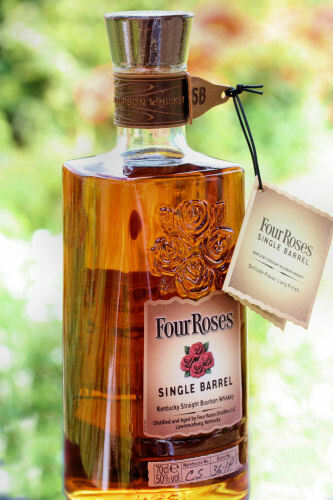 If you were wondering how the name Four Roses came about, according to the Four Roses website, it began when Paul Jones, Jr., the founder of Four Roses Bourbon, became smitten by the beauty of a Southern belle. It is said that he sent a proposal to her, and she replied that if her answer were "Yes," she would wear a corsage of roses on her gown to the upcoming grand ball. Paul Jones waited for her answer excitedly on that night of the grand ball… when she arrived in her beautiful gown, she wore a corsage of four red roses. He later named his Bourbon "Four Roses" as a symbol of his devout passion for the lovely belle, a passion he thereafter transferred to making his beloved Four Roses Bourbon! You can buy Four Roses Bourbon online here. Oh my, do I have to pick just one dessert Nicisme. I wouldn't turn down any of them. Would have to be the sticky toffee pudding for me!! All the dessert look so so drooling good. I'm hungry just looking at it and I just had dinner. I love all three dessets, love that bottle it looks so beautiful. After me adding the word verification i have not had those chinese mails, will se for fe more days. Yummy yum yum to everything you made! how unfair to put all this fabulousness in one post--i can barely fathom it! i have no use for booze as far as drinking it goes, but it's welcome in anything that looks and sounds as good as your treats here! Kentucky bourbon reminds me of home. I love cooking with it. I even have a new cookbook from the UK, the University of Kentucky that is, brimming with bourbon recipes. I love what you are doing with yours. And about the vanilla, who knew? I'll have to try that. I've used bourbon in bbq sauces and it is wonderful. But I must say I'd rather put it in the amazing looking cocktail. What are you trying to do to me - I can feel a heart attack coming on just looking at this lot - wow! Interesting that Bourbon can be used instead of vanilla. 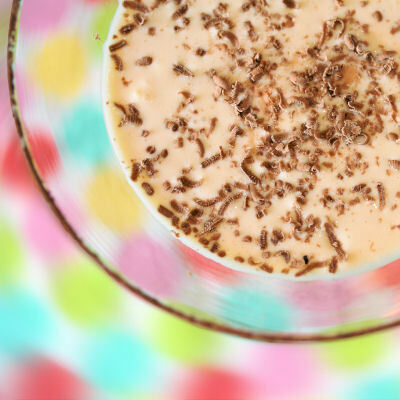 Valli - if I had to pick one, it would be the Mars pud. Happy cook - that bottle is lovely and I'm thinking about the word verification thingy. Daily spud - I didn't know that before either! There is so much you can do with bourbon, I'm looking forward to Christmas as I have some ideas! Lisa - Oh the cookbook sounds brilliant! Johanna GGG - you can sub whiskey for bourbon in any of these recipes, not sure that you can sub it for straight vanilla though. Fitness Foodie - I must try bbq sauce with it - thanks for the idea! Choclette - I think I had one after eating this lot, lol! Oh wow! Oh wow! I can see you have left a lot of faint-hearted women in your wake with this one. Fabulous recipes! Should I choose one now? Amazing! I did not know about that bourbon-vanilla substitution. Thanks! You know I've thought about it and don't really remember trying bourbon, though I am a whisky drinker..hmm.. Either way I want to now as all your dishes look so tasty, especially that cocktail, mmm!! Stop! Stop! You are killing me here. Those chocolate toffee desserts & the steamed pud... oh my word. I love cooking with bourbon as its sweetness is quite appealing in many dishes.